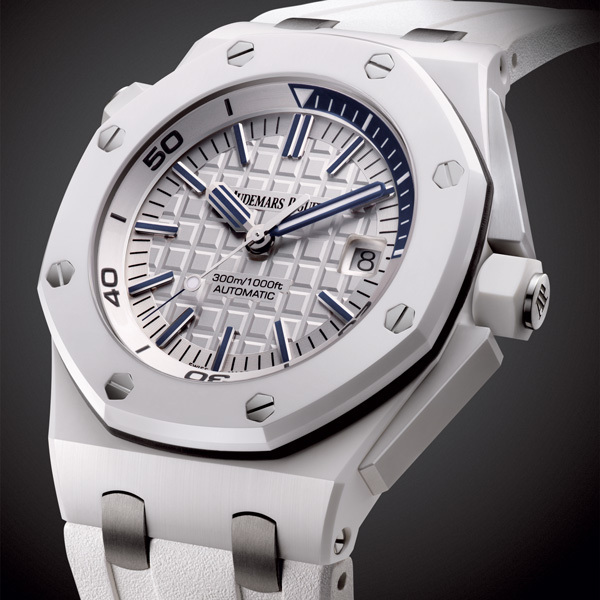 AS WELL AS BEING THE YEAR OF THE OFFSHORE, 2014 IS ALSO NOTABLE FOR THE BOLD USE OF WHITE CERAMIC AT AUDEMARS PIGUET. 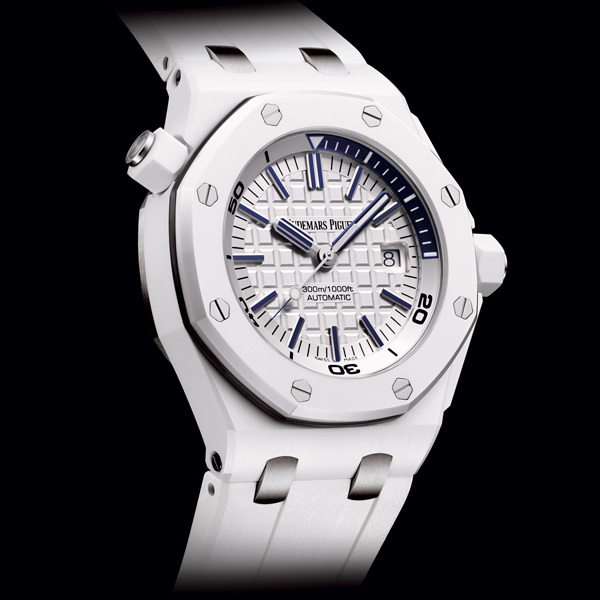 Not only is there the pre-launched Royal Oak Concept GMT Tourbillon with titanium case middle and white-ceramic bezel, pushers, crown and movement bridge (see ‘Savoir-Faire’ press kit), but the Manufacture is also expanding its formidable Royal Oak Offshore Diver collection with a dazzling specimen, positively glowing white with the ultra-hard composite material, even from the depths of the ocean. 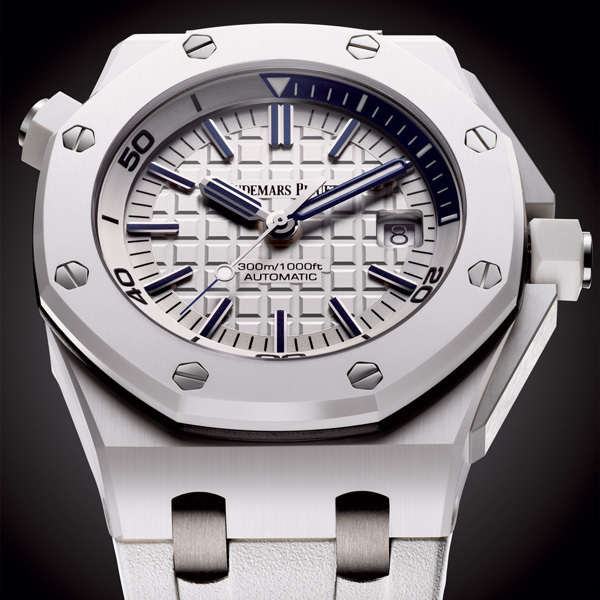 It perfectly complements the Royal Oak Offshore Diver range, which is water-resistant to 300m and protected by an anti-magnetic inner case. The model’s distinctive case-back screws, intermediate bolts and hexagonal screws secure the case as securely as a submarine hatch. The Diver is equipped with a time pre-selection device (NIHS 92-11 norm) and otherwise available in steel or in an even more sophisticated black on black ceramic version. For example, it takes around 12 hours to make the case middle, compared with 1 ½ hours if it were in steel; 8 hours to make the bezel, compared with 45 minutes if it were in steel. The upshot is that the new Royal Oak Offshore Diver is almost totally scratchproof, meaning in turn that the octagonal bezel’s trademark satin-brushing and polishing finishes are particularly difficult!